The football World Cup, currently being staged in Brazil, has reignited the debate on both solar energy and ongoing energy poverty in many countries around the world. Football’s global governing body FIFA has set the goal of making the World Cup carbon neutral and has installed solar panels on a large number of some of the country’s most recognisable stadia. In fact, four stadiums alone, including Rio de Janeiro’s iconic Maracana stadium, have 5.4Mw capacity of solar electricity. This is enough to power an estimated 20,000 homes in Brazil over the course of a year, including many families where energy poverty remains a significant barrier to socioeconomic progress. 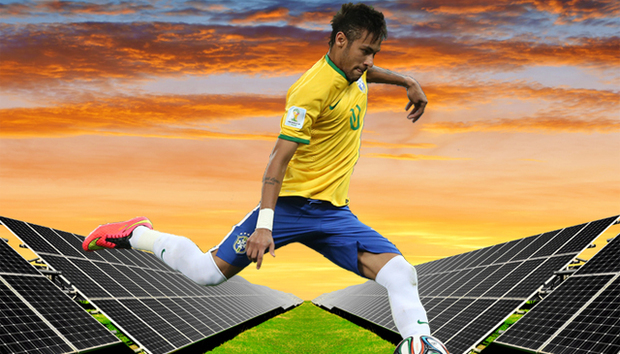 FIFA’s commitment to solar energy is to be applauded – the work undertaken in Brazil builds on similar projects established in South Africa during the 2010 World Cup – but what, if anything, does it mean for the long term future of sustainable energy? Energy poverty remains one of the most significant challenges facing the global population today. The poverty reduction charity Practical Action notes that almost a quarter of humanity, 1.3 billion people, do not have access to electricity. More than three million people use harmful solid fuels and biomass (wood and animal dung) to meet their energy needs for cooking. The challenges of introducing sustainable energy in many countries are evident from a quick glance at the tournament’s participants: one third of the countries represented at the World Cup produce less solar energy than just one of the stadiums they are playing in. The Maracana Stadium has the capacity to produce 500Kw of solar energy, whilst the whole country of Cameroon produces just 65Kw. Yet sustainable energy is high on the agenda of many global organisations because many citizens lack access to electricity and clean cooking facilities. The United Nations alone has set specific goals as part of its Sustainable Energy for All initiative to achieve universal energy access, improve energy efficiency and increase the use of renewable energies. Whilst it is clear that there is still a considerable way to go globally, FIFA’s commitment to making this World Cup ‘the greenest in history’ does provide an insight into the many positives and possibilities associated with solar energy. The Arena Pernambuco, a stadium built in the City of Recife and the venue for five matches throughout the tournament, will generate upwards of 1,500 megawatt hours annually. This amount of energy is equivalent to roughly 6,000 Brazilians’ annual electricity demands. And all power that is not used by the stadium is distributed to the community via the local electricity grid, providing a sustainable source of energy to many residents for the first time. Brazil also offers opportunities for the solar market to rapidly expand: Yingli Green Energy, one of the official sponsors of the World Cup, clearly recognises the potential for growth. It currently commands the market share of solar energy modules (upwards of 30%) and anticipates that Latin America will be its fastest growing market over the next 25 years. Yet despite the company’s optimism regarding Brazil’s development, recent events serve as a reminder of the political and economic obstacles that the solar energy market faces: the abundance of cheap, hydroelectric resources in the recent federal energy auction meant that solar wasn’t even included as an alternative energy source due to being considered economically unviable. However, this does not reflect the national picture and it is largely considered that solar power is an excellent complementary source to hydroelectric power. In fact this may be the beginning of the wider introduction of solar power across Brazil. This is because many states and regional bodies are beginning to express an interest in this energy, as they are starting to realise that there are more pressing environmental and economic reasons that demand attention, aside from the bottom line. This was brought sharply into focus by Brazil’s recent drought, where the government subsidised the energy sector to the tune of US$1.7bn. With further borrowing and bailouts required, tensions are likely to rise with costs most likely to be added onto the bills of consumers. Unrest and political protest by many Brazilians during the World Cup serves as a stark reminder of the inequalities that persist in many populations around the world. Large volumes of the population remained outraged at the cost of hosting a World Cup seemingly at the expense of wider infrastructure and their standard of living. Whatever the future of solar energy in both Brazil and the rest of the world, it is clear that a holistic approach is required: sustainable energy policies must be careful not to put low and middle-income families and individuals into worse economic shape. Perhaps a future where renewable energies and energy policy plays a significant part in both alleviating and lifting people out of poverty would be the most fitting World Cup legacy of all. Adam Gowland is a UK based public health professional with an interest in the relationship between sustainable energy sources and global health inequalities.